Your very own Wise Guy! 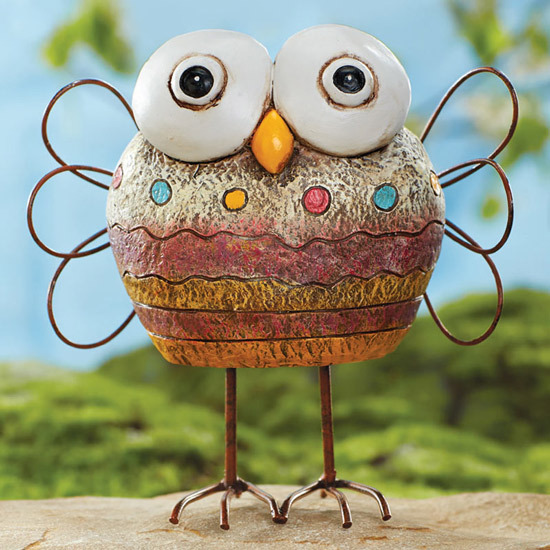 This cute, crafty character brings plenty of charm to your garden or patio. He appears to be handmade of natural stone, but the clever look a like is actually rugged, weather resistant polyresin and metal. 6"h.
What a delightful garden ornament! This precious little owl is very well made, and so sweet! I purchased him as a gift for my daughter, who decided he was too cute to put outside where she couldn't see him all the time, so I can't comment on how sturdy he is outdoors. BUT...I'll be purchasing more for her garden - and mine.